Dr. Yoon was very attentive and engaged throughout my appointment. She did a wonderful job asking questions to make sureshe completely understood what was going on and how she cold help me. She was personable and friendly and made me feel comfortable. I would highly recommend her to anyone who is seeking an allergist. Dr. Yoon was very attentive and engaged throughout my appointment. She did a wonderful job asking questions to make sure she completely understood what was going on and how she coldhelp me. She was personable and friendly and made me feel comfortable. I would highly recommend her to anyone who is seeking an allergist. Dr. Jenni Yoon is an accomplished allergist board certified by the American Board of Internal Medicine. She is a part of the Allergy and Asthma Center and sees patients at several offices across Maryland. 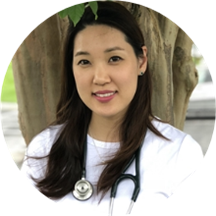 Dr. Yoon earned her medical degree from the Ross University School of Medicine and went on to complete a residency in internal medicine at MedStar Good Samaritan Hospital. She concluded her training by completing a fellowship in allergy & immunology at the University of South Florida. Dr. Yoon is an active member of both the American Academy of Asthma, Allergy, and Immunology as well as the American College of Physicians. She has presented nationally on several topics pertaining to asthma, allergy, and immunology. She has research experience in the microbiome and its association with allergic disease and immunodeficiency. Patients see her for the treatment of insect bites, hay fever, allergic cough, sinus problems, and food allergies. Dr. Yoon enjoys spending time with her husband, family, and friends. She also enjoys watching British television shows, playing with her French bulldog and exploring new restaurants. Dr. Yoon was very knowledgeable and informative. I'm happy to have found her! Dr. Yoon was unhurried, thorough, genuinely interested and caring. She's an excellent doctor. I was pleased with the friendliness of the staff and doctor. The doctor and staff explained each step and asked repeatedly if I had any more questions. The visit was not rushed and I felt very comfortable. She is a knowledgeabledoctor that has a great "bedside" manner. I highly recommend.